From a paper warehouse in Nairobi to a lithography studio in Copenhagen, Kenyan-born, U.S.-based artist Wangechi Mutu’s transnational aesthetic takes printed matter we so often consume and discard and transforms it into something of weight and permanence. This conversation took place 28 August 2014. 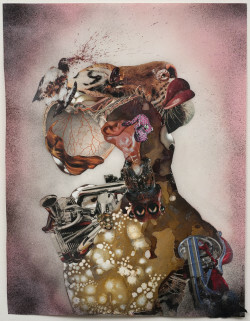 Wangechi Mutu, Homeward Bound (2009), archival pigment print with screenprint, 24 x 18 1/4 inches. Edition of 45. Printed and published by Edition Jacob Samuel, Santa Monica, California. Courtesy of the artist. Zoe Whitley I’m struck by how foundational works on paper are to your practice. While your work today spans installation, moving image and an array of other media, can we speak a bit about the materiality of paper and what that means to you? Wangechi Mutu Well, I don’t know where exactly to start. A childhood anecdote comes to mind: my father was a businessman with a paper distribution company. He was a middleman importing paper from Germany. He had a huge warehouse we played in as children. I remember as a kid being enamored with drawing anyway, but the nice thing was being a kid whose dad had a vast array of paper. As much as he brought home paper, I always ran out and ended up drawing on walls! That motion, that sense of movement across the page was constant for me. I continued with that obsessive level of drawing out my thoughts, even more so than writing. I’m a visual thinker. If I can capture it in an image, through drawing, it helps me think clearly. That’s why biology and physics were the two scientific subjects I excelled in at school; because they both require capturing information visually: drawing, for example, a cell with its nucleus and organelles. Things come alive when you can draw them. Paper helps establish a mind frame. Some people have journals [to write in], but I often know my state of mind, my anxieties, my fears, my hopes based on what I record on paper. It’s part of my psyche. It’s also how I plan things that are motion-based or three-dimensional. Collage is a means of economizing that visual process. I insert something in there—say, a magazine landscape—to convey what I am trying to express. I think drawing is connected to the subconscious. If you free yourself up, things may come up that you aren’t consciously aware of. Whatever rumblings and interests are residing deep within will come out. Drawing pulls it out of you—it’s extracting the minutiae embedded that isn’t yet fully formed. Drawing is a beginning, and it gets more elaborate. 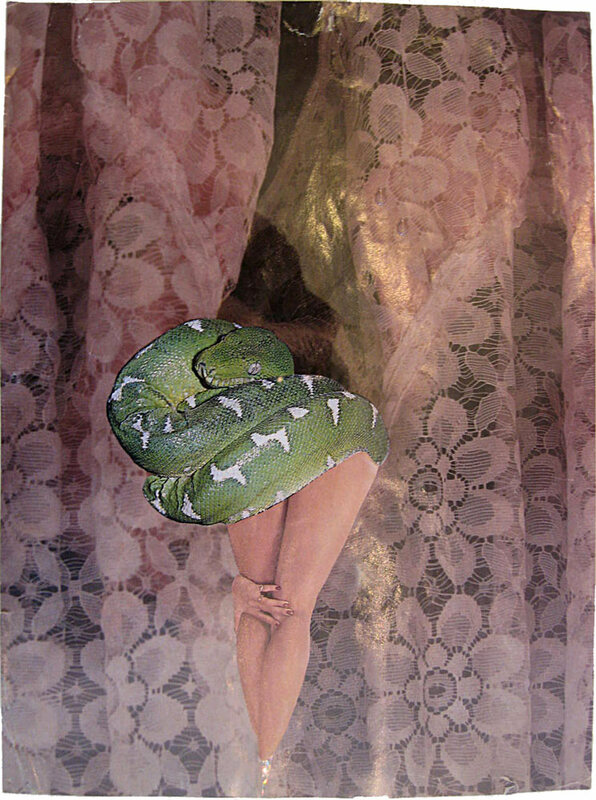 Going through collage and now with the print-collage-paintings, I’m increasingly accessing painting, and I never really considered myself a painter before now. ZW Collage is usually the first thing one thinks of when visualizing your artwork. I’m fascinated how you have marshalled existing printed matter—usually offset commercial prints from magazines—in the formation of your aesthetic. When did this experimentation with printed publications begin? WM Oh my goodness—I think it began way back, further than I can quite remember, as a child. I can absolutely be sure of using collage for my college applications to American universities. I applied by doing Picasso-esque collages of kitchen scenes—a jug of milk and a chair—using bits and pieces of Time and Newsweek, having seen Picasso on school trips to museums. I travelled to Spain in 1990, and the modern and contemporary art I saw there made a big impression on me. It seemed to break up space in a way that helped me understand contemporary art. I was interested in how these art forms shifted our perceptions, how African art I recognized had been incorporated into the modernist avant-garde. Left: Wangechi Mutu, Untitled (c.1993-1996) print on paper. 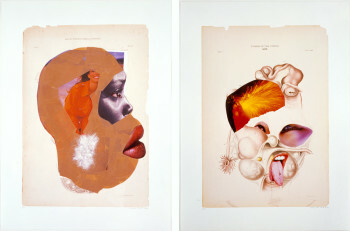 Right: Wangechi Mutu, Untitled (c.1993-1996) print on paper. Both images courtesy of the artist. All this helped me understand what the American schools were looking for. I was on a beautiful little island called Lamu, off the coast of Kenya. I was there to work, to get away from home and apply to school. It was very remote. I’d take my watercolors and magazines to the port and make pictures. I’d draw still lifes—awful still lifes until my eyes popped out of my head! I was never interested in a simple representation of the world around me. I was much more interested in abstraction. My first official collages used one reality to create another by fragmenting and playing with the illusion of space and perspective, or disregarding perspective completely. So that was my initial delving into using publications, Newsweek and Time magazines. Not amazing paper but colorful and varied. My dad was obsessed with finding out what was going on in the world. In our house the radio was on constantly, listening not only to local news but also BBC radio. Often in an African context the radio is the first [thing] to be taken over by militia groups, or the airwaves commandeered to promote propaganda of the ruling party. You often had to circumvent or at least supplement local news. He also ordered National Geographic for most of my childhood, which I still use in my work today. ZW I consider you a maker of prints for the innovative way you appropriate and repurpose existing prints, literally creating a new visual form from the printed material around us. WM There’s something about looking at physical, tangible works that is still relevant because many magazines won’t survive this Internet age. There’s a particular physicality to holding something, the stratified imagery, leafing through pictures. I also like the process of finding things you are interested in but also how that is juxtaposed with the encounter of seeing things you weren’t necessarily interested in. Wangechi Mutu, Eve (2011), archival pigment print, 20 x 16 inches. Edition of 75. Printed and published by Edition Jacob Samuel, Santa Monica, California. Courtesy of the artist. The etching and aquatint portfolio Eve (2006), made with Edition Jacob Samuel [Santa Monica, CA], started with tiny collages of compositions pared down to two things—like a bicycle wheel and a woman’s leg. When you look at publications, you make mental associations between images. Those relationships have a ton of information in them. How they are composed on one page affects how you look at the next page. The hierarchies help you read the next image. But these can also be problematic in the way they lead you to arrange the world. I’m always trying to decode what the magazine is trying to convey. There are illusions and fantasies presented as fact. Physically looking and thumbing through makes me able to come up with a new way to systematically critique our image culture. I used to work using negative space with printed imagery, too—cutting out of one page in order for another image to emerge through that shape on a different page. 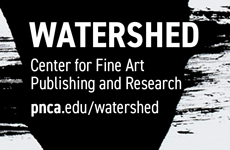 ZW Can you recall the first time you ever worked in the medium of printmaking? WM I learned how to etch and make aquatint at Cooper Union [in New York]. It was there I had to commit to an image being finished. I always want to go back and work on it more. But printmaking is an extremely disciplined practice. To have them be identical you can’t go back in and rework them. It’s a strange process because unless something is framed, I always feel I can go back to it. But with prints, I had to commit. I first made some etchings of dreadlocked people with drooped heads; I was thinking about hair, history and the Mau Mau [the African nationalist movement active in 1950s Kenya]. I felt they [the prints] were successful and I was finally making something my family would be proud of. I was so young and did not necessarily feel supported as an artist at the time. It was an image that I was able to show my parents and my aunts and uncles. I gave one to my uncle and he even had it framed. He has it still. It was not only a technical process of how to create a print but also how to retain the integrity of the image from one print to the next. Printmaking became important for me to distinguish another form of two-dimensional art. I learned the technical basics during my BFA but then didn’t make prints again in graduate school [at Yale]. I have only just gone back to experimenting with printmaking. 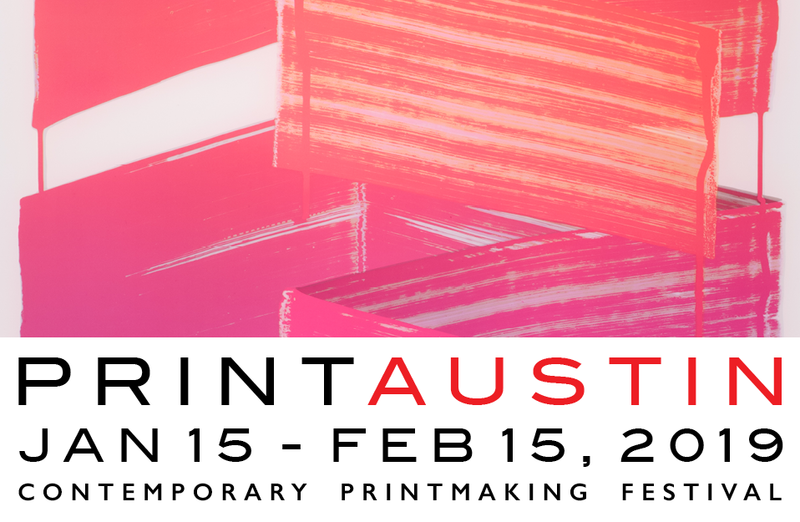 Ultimately, it’s a collaborative process with the printmaking studios. The ghost collaborators are such a part of it: working with Rasmus Urwald at Edition Copenhagen was an amazing experience. The way that place works is remarkable. [I got] to go somewhere and leave with renewed energy. 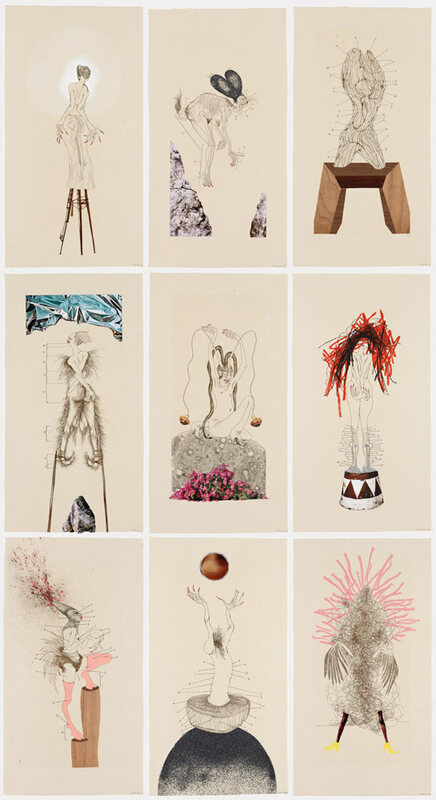 Wangechi Mutu, The Original Nine Daughters (2012), series of nine etching, relief, letterpress, digital printing, collage, pochoir, hand coloring and handmade carborundum appliques, image 15 x 7 inches each, sheet 19 x 10 inches each. Edition of 30. Printed and published by Pace Editions, New York. Courtesy of the artist and Pace Editions, Inc. I have an extremely laborious technique. My work is to massage and fiddle with many pieces for a long time. Prints lighten the load. I can ask for help in a way that makes sense. I don’t typically trust other people in the decision-making process—I make a lot of decisions while gluing—but prints allow me to let go. More people are allowed to access the work, to see it, to buy it, to live with it. I have really begun to invest a lot more thought in what multiples can do to a number of topics, issues and problems. The Born Free [tote bag] project1 was surprisingly successful in that regard. In the end, no one needs a new handbag, but if the print helps tap into our psychosis in a capitalist world, then it’s a good thing. ZW Your print Homeward Bound (2008) was also created to raise funds and awareness for Ms. Sarah, a victim of Hurricane Katrina. WM Yes, it was one part of an installation to commemorate and focus on the aftermath of Hurricane Katrina during the Prospect 1 biennial.2 But using a title referring to coming back home was important not only for the people affected in the Gulf but also for me personally due to my inability at the time to travel back to Kenya under my visa restrictions. I undertook the process naively. I didn’t understand at the time about New Orleans and the environmental problems and deepseated political and sociohistorical contexts. People close to the coast were devastated by the hurricane, of course, but the area had long been neglected and raped so that there were no longer the natural water forests and mangrove-type swamps that once provided natural protection against extreme weather. The combination of deforestation and the death of plant life from oil contamination contributed significantly. That print was therefore tied to a much deeper plantation culture and the dirty business of Big Oil. The BP oil spill happened just after. The levees weren’t maintained just as the BP rig hadn’t been maintained. The process taught me a lot about what it means to “help” or to think you can come in and help. In the end, the house for Ms. Sarah was rebuilt. It was a testament to hard work—not only my own but an architect-activist named Tye Waller. She repurposes bathrooms and kitchens from the Northeast through a salvage firm, given the many well-off people who make cosmetic updates to their property every few years. She then has the interiors driven down and uses them to rebuild for those in need. ZW: I can see a parallel in that interstate resourcefulness and salvage mentality found in your own transnational repurposing of images. WM I think so. She project-managed for me and we raised the money based on selling 90 percent of the prints. The prints were a vehicle but also raised awareness. They were therapeutic, as I was really trying to sort out my visa to get back home. There was a parallel push in terms of why I was making art. The figure in Homeward Bound is a sea-lion–humanoid braying, asking to be taken home. For me the relationship is poignant between the sheer exertion of will and the weight of the surrounding circumstances. ZW I’d also like to discuss your more recent prints, such as the suite of etchings The Original Nine Daughters (2012). 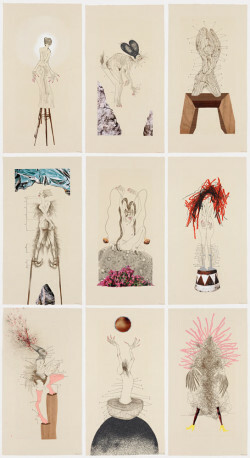 Wangechi Mutu, from Histology of Different Classes of Uterine Tumors (2006), 12 digital prints and mixed media collage, 23 x 17 inches each. 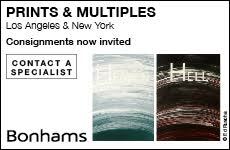 Courtesy of the artist and the Susanne Vielmetter Los Angeles Projects, Los Angeles. WM I made that suite of etchings with aquatint, linocut and collage at Pace Prints. The Nine Daughters are part of the Kenyan creation myth, our Adam and Eve. The nine original tribes and clans come from there. They are all freakish poetic hybrids, not literal. Some prints make connections between Renaissance and Victorian etchings, but they are all esoteric. None of the scientific information is accurate. They also have pins in the body as markers of body parts and body types, which recur in my work. Second born, an etching [with collage] from 2013, is dedicated to my second-born. It took me a year to make, but I wanted to articulate a maternal figure. The mother is in fact holding a child made out of the rescue blankets I use in my installations. There is also the medical series, Histology of the Different Classes of Uterine Tumors, that I made with Hare and Hound Press in San Antonio. They produced most of it, consulting with me at a distance. Those 12 works are all medical diseases of the female reproductive organs. I wanted them to survive as they were on very acidic, yellowed paper. We printed using an inkjet collage technique with hand additions. I added hair, glitter and rabbit-fur sideburns. All the hand additions were to break up what the medical prints originally implied about illness and infertility. The added tactility of the collage over the prints changed the dimension of the work. The interplay in my work of repugnant and seductive aspects renders approachable, tactile and highly visible inequities in gender and in medical research— things we might otherwise avoid or ignore. Printmaking becomes a way to make it relevant and push people to think about it in a contemporary context. ZW Moving on to your most recent works, what did the lithographic process bring to bear for you? WM: What I was so excited about was using the lithographic stone. The ancient surface was able to take on and hold an image in a particular way. The extremely smooth stone is in itself an archive—it holds fossils and arthropods and shells unearthed from the ocean millions of years ago. I thought so much about the stone itself as an archive and how to represent them. I was so influenced by the creatures that were already present. It’s a burial ground for so many organisms, and I’ve represented some of that buried history in the latest work. The exhibition “Nguva na Nyoka” (“Sirens and Serpents” in Kiswahili) presents Mutu’s latest body of print, collage, video and sculptural works at Victoria Miro Gallery in London through 19 December 2014.